Red ginger grows widely all over the Big Island of Hawaii. 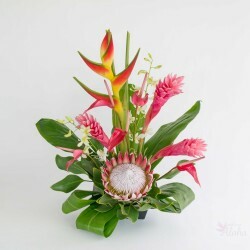 One of our favorite Hawaiian flowers, the red ginger flower is about 6 inches long on a tall stem. 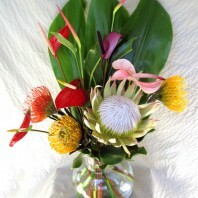 We include extra hardy red anthuriums along with white orchid sprays. We add foliage greens to create our vibrant red and white Ahi (fire) assortment. 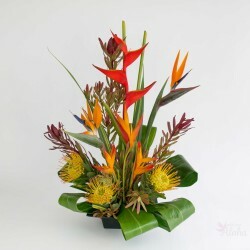 This assortment invokes the fire from Hawaiian volcanos and the white cap of Mauna Kea. The red ginger is actually a ‘bract’. Over time it will open with tiny white flowers from each opening. While this assortment is good for any occasion the bright red and white make it a favorite for Valentine’s Day flowers. 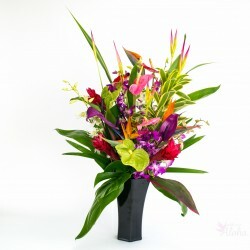 You can send Hawaiian flowers any time of year and be confident they will be enjoyed. All of these stems are long lasting. 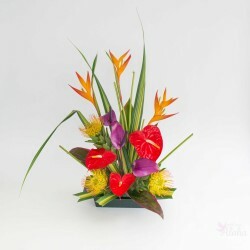 The red anthurium can last up to two weeks with normal temperature and occasional fresh water. 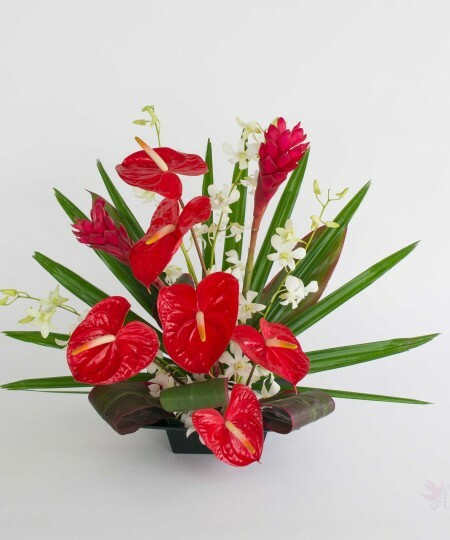 For longer life both the anthurium and the orchids can be submerged in clean lukewarm water for about ten minutes. 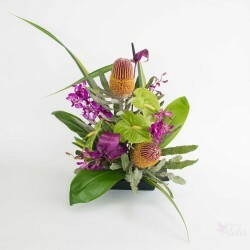 Flower care instructions will be included with your order along with ideas on arrangements. 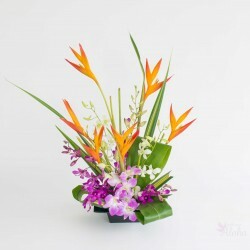 It is easy to arrange these tropical flowers in a simple twelve stem arrangement as shown in the picture. 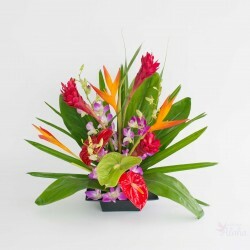 Typically the red ginger will be the tallest element of your tropical arrangement. 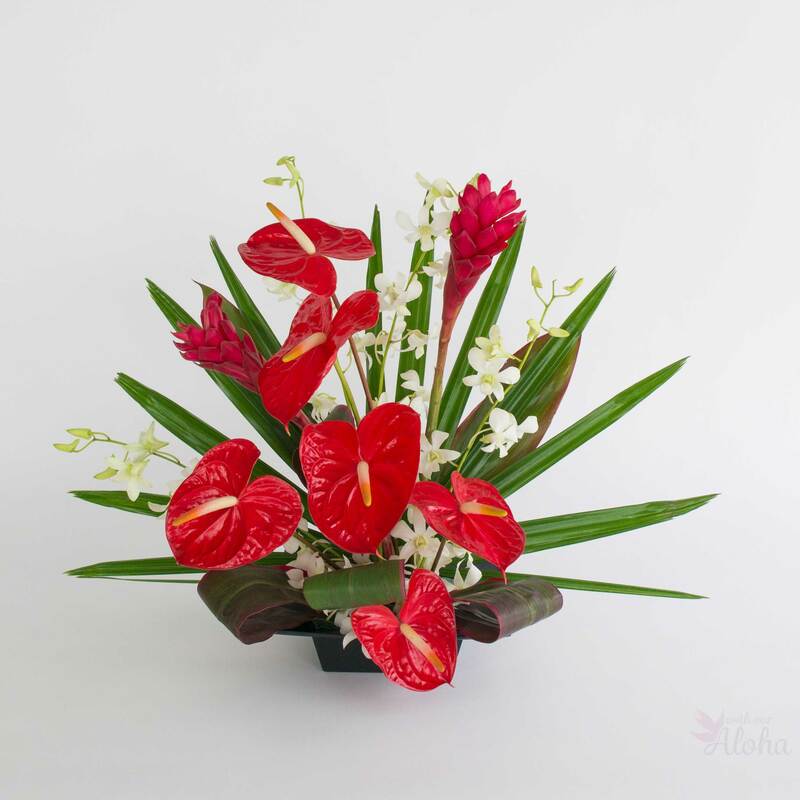 Surround it with the wide, red anthurium to represent the fire and the lacy white orchids as delicate wisps of smoke. 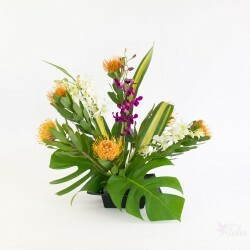 Embrace the flowers with the green ti leaves and raphis palm to complete your Hawaiian flower arrangement. 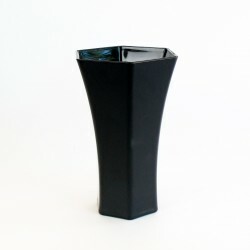 These flowers can also be displayed in simple round vase. Flowers come full stem and not arranged. Last minute orders are subject to substitution. 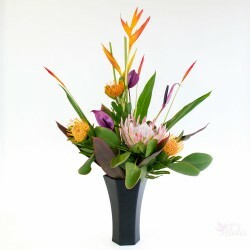 Available in 6, 12 or 24 stem assortments plus greenery.